I have been deeply disappointed in how the City has handled the homeless community in Wentworth park this month. This community, along with the homeless in Belmore Park appear to be growing in number. My staff met with community members living in the viaduct arches to speak with those living there about their experiences. Many were deeply distressed at perceived threats by Council to remove all of their possessions from the archways. Early last week when a clean-up of Wentworth Park was conducted City staff removed the tents from under the archways. I have spoken to senior staff who have cited illegal camping, fire safety and alienation of public space as grounds for removing the tents. They have referred to a previous incident where a homeless person set a tent on fire while cooking inside it, as a strong reason to remove homeless people’s tents. I was excited to find an organization that was starting up micro-housing in my area. But, on closer examination, this organization has no intention of housing the homeless, but putting portable housing units on private property and using them to rent “to low income people”. The person who runs this program told me it WAS NOT intended for homeless individuals, BUT when interviewed on the news, he claimed the program was to relieve homelessness in our area. Two faced! Unfortunately, it is the shy, modest people who get trampled upon in this world. Thank God there is a heaven. Any company, agency, government, school, healthcare provider, individual, who seeks to minimize the voice of those they claim to serve is an oppressor. To be fair, some get caught up in group-think and find themselves supporting decisions, methods, laws, protocols, directives that oppress a group or groups of individuals. Others know bloody well what they are doing. Some oppress out of a palpable dislike for those they claim to serve, while others do so because those they serve, people with disabilities (PWD) for example, are little more than revenue streams in their eyes. Moreover, PWD have been used as fodder for those who revel in the sewage of arrogant self-aggrandizement. On Wednesday, January 28th, the Residence Hall Association in collaboration with Phi Beta Sigma fraternity hosted its fourth annual Sleep Out for the Homeless event in the TMB Auditorium. Sleep Out for the Homeless is an event designed to raise awareness for the homeless population in Northeast Alabama. Donovan Wilson, a Junior majoring in business management, serves as the vice president of Phi Beta Sigma as well as the coordinator of this year’s Sleep out for the Homeless event. 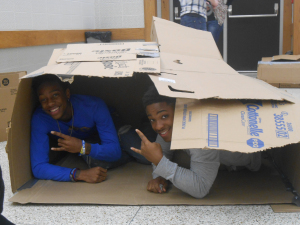 Katie Cline/Chanticleer – Members of Phi Beta Sigma participate in the Build-A-Shelter competition. Looking back on January (wow didn’t it fly by) with what I’d set in place for the year I’m on track in some areas but others still need work. I’m still sofa surfing, but for now settled for a few weeks, it’s takes an age to go through all the varies agencies that can help and I’ve filled in forms until I’m dizzy, however I’m still ploughing on, because I need to have a base I can call my own, and even with friends etc their generosity in giving me their sofa can wear thin. Last week I had a bereavement which I carried me all through the week, it’s easier now, there is always that danger of falling of the edge if you know what I mean, that was more an emotional set back, and when you’re treading water it can be iffy to say the least. Devon Kelleher is one ten-year-old with a big heart. Whenever she saw a homeless person, she couldn’t understand why that happened, so she decided to do something about. Hear her inspiring message on this podcast. Two organizations synonymous with the 2008 financial crisis could play vital roles in helping America’s most vulnerable residents get off the streets. ThinkProgress reported that Fannie Mae and Freddie Mac — two government-backed mortgage companies whose buying and guaranteeing of risky mortgages contributed to the Great Recession — are now able to contribute to the National Housing Trust Fund. The fund was created in 2008 to support affordable housing initiatives nationwide but had laid dormant until now, as the Federal Housing Finance Agency (FHFA) announced in December that “both [Fannie Mae and Freddie Mac] are financially fit” to contribute. The two organizations were barred from setting aside money for the fund previously due to the financial crisis.